Fancy leaving your classroom and having your lessons somewhere COMPLETELY different? For the past few years we’ve done just that through the School Without Walls (SWW) creative learning programme during Term 6. St Andrew’s is one of the first schools in the UK, outside of London to have been involved with this initiative! From history and geography to art and RE, the SWW workshops cover the whole curriculum from a totally new perspective. And the children love it. Activities include: drama, dance, film-making, creative writing, collage, history walks and woodland craft. In 2011 and 2012, School Without Walls was piloted at the Egg Theatre, where Year 4 spent 6 weeks learning core curricular topics, but from new and different creative perspectives. It was such a success, that we wanted more pupils to enjoy and benefit from this unique learning platform. So we got the WHOLE school involved for the first time. 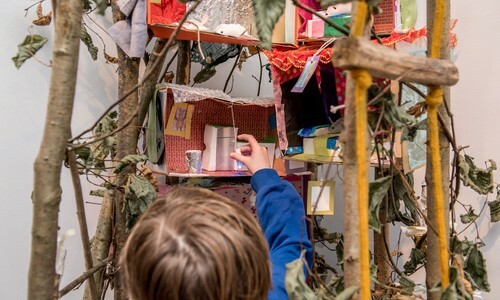 Our children learnt at the Holburne Museum, the Central Library, St Swithin’s church, the Egg theatre, the Bath Spa University college of Art and Design and the Museum of East Asian Art. What was School Without Walls like?